AKA Maurice Joseph Micklewhite Jr.
Michael Caine was born Maurice Micklewhite Jr., and dropped out of high school at 15. He supported himself as a manual laborer, and served two years in the British Army, before landing work as an odd-jobs man behind the scenes at a London theater. He had long had an interest in acting, and soon stepped into on-stage roles, where his talent became apparent. Feeling he needed a more catchy professional name, Micklewhite decided on Michael (from Mickel), and Caine when he saw a theater's marquee advertising Humphrey Bogart in The Caine Mutiny. He first came to American fame playing an effete lieutenant in Zulu (1964), but he already had a long résumé, dating back to the mid-1950s. 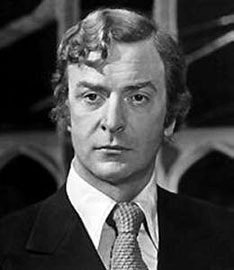 Caine has appeared in more than 100 movies, including hits like Alfie, Mona Lisa, Educating Rita, and The Quiet American, enjoyable mysteries Sleuth and Deathtrap, and comedies like Dirty Rotten Scoundrels. He has two Oscars, for Woody Allen's Hannah and Her Sisters (1986) and The Cider House Rules (1999). In 2010 Caine publicly admitted that in 1955, as his father was dying of liver cancer, he persuaded a doctor to give his father a fatal overdose of painkillers.